AMSTERDAM, The Netherlands, September 26, 2013 (ENS) – Greenpeace International condemned a series of Russian court rulings today which left 30 activists in custody pending investigations into a protest against Gazprom’s Arctic oil drilling earlier this month off Russia’s northern coast. Twenty-eight Greenpeace International activists, as well as a freelance photographer and a freelance videographer, were taken to the Lenin District Court in Murmansk in handcuffs, where they were placed in a cage and provided with translators Greenpeace says were inadequate. Of the 30, 22 were remanded in custody for two months pending an investigation into piracy charges, while eight were detained for three days pending a new hearing. A full list of those detained is found here. 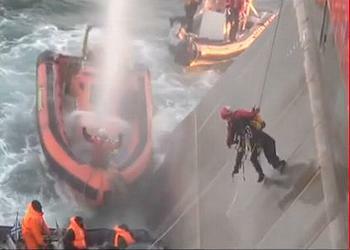 Greenpeace said its lawyers would lodge an appeal seeking their immediate release. 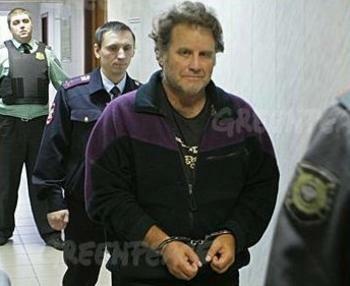 One of those remanded, Peter Willcox, the American captain of the Greenpeace International ship Arctic Sunrise, is under investigation for alleged piracy under Russian criminal law and will be held in custody for two months as investigations continue. In 1985, Willcox was captain of the Rainbow Warrior when French agents bombed the vessel, killing one of the crew. He is the only American among the 30 Greenpeacers who are being detained. On September 18, two Greenpeace activists scaled Gasprom’s Prirazlomnaya drilling platform to stop it from producing the world’s first oil from Arctic waters. The Russian Coast Guard fired warning shots, detained the two activists under armed guard and seized the Arctic Sunrise, which they towed into the Port of Murmansk. Greenpeace International insists that any piracy charges are unjustified, and that Russian authorities boarded the Arctic Sunrise illegally in international waters. Over 500,000 people have written to Russian embassies around the world since the ship was seized a week ago, and Greenpeace is organizing solidarity protests Friday in cities around the world. Speaking at a forum in Salekhard called Arctic – Territory Of Dialogue, organized by the Russian Geographic Society, Putin suggested that the Greenpeacers may have broken international laws.